Jefferson Regional Foundation has released the second in a series of Priority Briefs focused on each of the Foundation’s three strategic priorities: Increasing Health Access and Prevention, Improving Child and Family Outcomes, and Strengthening Vulnerable Populations and Communities. Here are highlights from the June 2015 Priority Brief on Strengthening Vulnerable Populations and Communities which relate to areas of focus within this priority. Convene and/or support collaborative efforts with economic development, community development, social and human services, and education organizations to begin the process of long-term, systemic change for Jefferson communities. 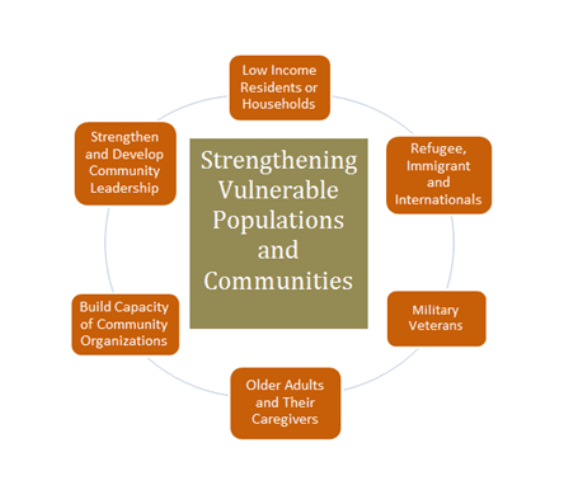 The Strengthening Vulnerable Populations and Communities priority brief can be found HERE. guide Foundation grantmaking in our priority areas. We welcome your comments or suggestions at foundation.info@jeffersonregional.com.